"I'm just a creative girl who loves to crochet and doodle cute things. 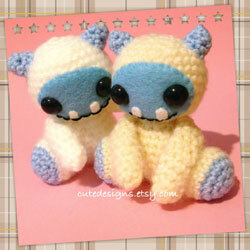 Welcome to my world of cute creations". I love animals and they are my biggest love and inspiration. I especially love cats and couldn't imagine not having one in my life. All the items on this site are designed, handmade and crocheted with love. They are miniature collectable plush for adults over the age of 14 and are not sold as toys for children, they are not suitable for play. I have a very busy mind and my imagination is always on the go, I'm always coming up with new plush or grabbing a pen to doodle my latest idea, most of which never actually get made as sadly, there just aren't enough hours in the day!